Starting and Organizing a BPM Project, developed and taught by Shelley Sweet of I4Process. This class shows you how to get started in BPM, who you need on your project team, how to conduct the information-gathering meetings and workshops, and how to interact with the executive sponsor and other stakeholders. You’ll learn how to create a project charter, high-level map, and project roadmap. The course includes hands-on exercises, some using a BPMN tool. 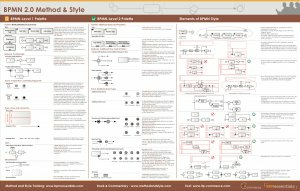 BPMN Method and Style, developed and taught by Bruce Silver. This class is the gold standard in BPMN training, based on the book of the same name. It shows you how to describe the process logic – the order of activities – in BPMN 2.0 models that not only conform to the rules of the spec, but reveal the process logic clearly from the printed diagram on its own. You’ll learn the shapes and symbols you need to know, and which ones you can ignore, as well as a step-by-step methodology for going from a blank page to a complete process model. And you’ll learn elements of BPMN style, reinforced by style rule validation in a choice of BPMN tools. Process Analysis and Redesign, developed and taught by Shelley Sweet. This class teaches you how to analyze your current-state business process for potential improvement, using a variety of Lean-oriented tools and techniques. You’ll also learn principles of process design proven to reduce time, cost, and waste, and improve customer satisfaction. Decision Modeling Essentials, developed and taught by Larry Goldberg and Barb von Halle of Knowledge Partners International. Based on their revolutionary book, The Decision Model, this course teaches you how to model decision logic – sometimes called “business rules” – used across business processes in a way that is maintainable by the business even when there are hundreds or thousands of rules. It shows you how business rules and BPM work together in real-world solutions. BPM 101, planned for Q1 2013, developed and taught by Bruce Silver. This class provides an introduction and overview of BPM as both a management discipline and a set of tools and technologies. More on this to follow! All courses in the curriculum feature in-class exercises using tools and post-class certification of proficiency. Unlike much of what passes for BPM training, our curriculum is designed to give students practical skills they can use themselves in their BPM projects. Also, the course content is aligned, defining a coherent and comprehensive program of skills training for the BPM practitioner.